The Best Price to Performance Ratio in the Extra-Large, Professional 3D Printer Category. 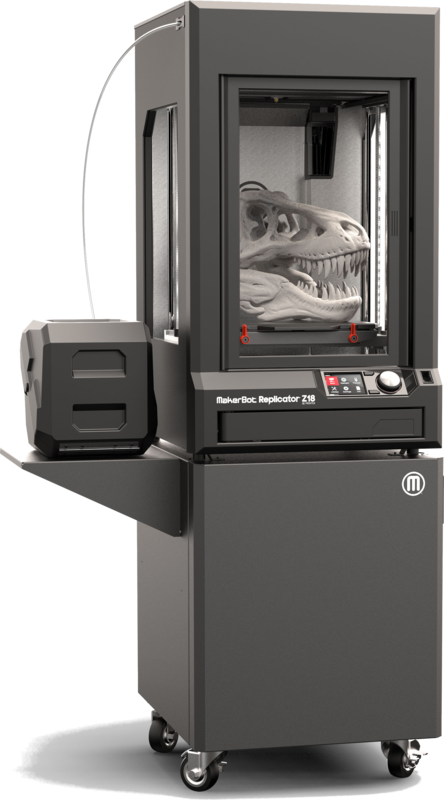 With a massive build volume and the best price to performance ratio in the extra-large, professional 3D printer category, the MakerBot Replicator Z18 3D Printer solution is ideal for hands-on and technically adept users. The MakerBot Replicator Z18 seamlessly integrates with the growing MakerBot 3D Ecosystem of hardware, software, materials, and accessories. It’s powered by the user friendly, app- and cloud-enabled MakerBot OS, enabling you to remotely monitor your important 3D printing projects. MakerBot Replicator Smart Extruder is easy to swap or replace and is designed to help youminimize downtime and quickly adapt to improvements in materials without replacing entire printer. Satisfy Curriculum: 3D printing and design offer a rich way to enhance and reinforce science, technology, engineering, art, math, and design skills already being taught in the classroom. Engage Students: 3D Printers engage students in the process of design and making all while enhancing their ability to solve problems through creative and collaborative solutions. Prepare Students for STEAM degrees and careers: Today’s professionals use 3D printing to advance product development cycles. It also provides students with tangible, hands-on experience in STEAM subjects and engineering fundamentals. Click to watch the video about Makerbot.